Iza Tarasewicz’s practice includes sculpture, performance, and drawing, often exploring dualities such as permanence and ephemerality, the organic and the artificial, the common and the extraordinary. 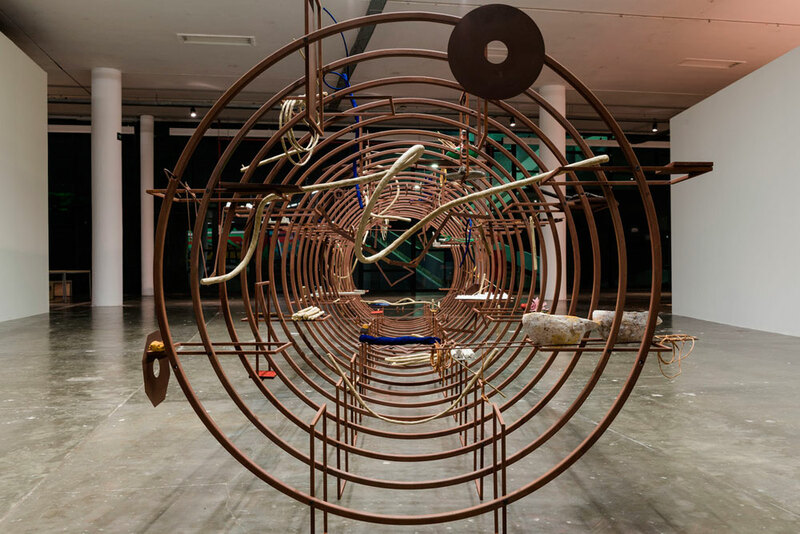 At the 32nd Bienal, Tarasewicz presents TURBA, TURBO (2015), a sculpture consisting of a display structure inspired by both a modernist plant stand and CERN’s Large Hadron Collider, in Switzerland. Experiments with raw materials are placed on this structure as if the giant machine were to accelerate their particles to the speed of light and collide them with each other, provoking chaos to study the origins of the universe. Connecting the infinitely large to the infinitesimally small by using prosaic proportions, TURBA, TURBO suggests an affiliation between the scientific and the domestic. Additionally, Tarasewicz developed a research project entitled Mbamba Mazurek, which traces the influence that the rhythm and dance of the Mazurka —whose origins date back to sixteenth century Poland in a rural region called Mazovia — has had across the world. The Mazurka is a musical form that has blended with many Brazilian regional styles; traces can be found in forró and coco, for example. Inviting local performers to collaborate and share their knowledge, the project explores the circular relationships between labor, dance, rhythm, and community in global folk practices.